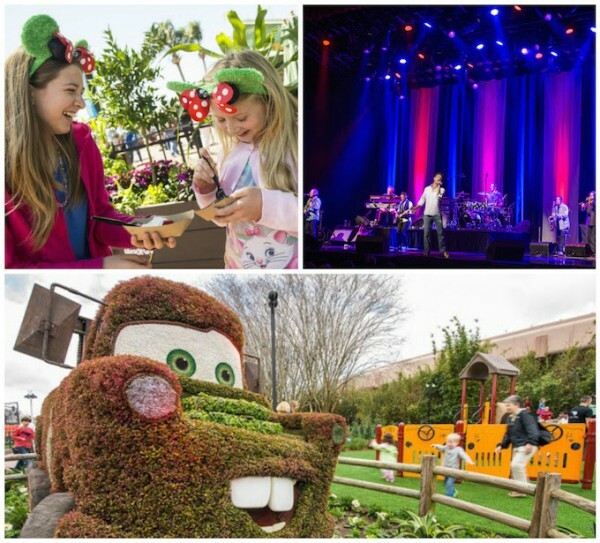 2016 Epcot Flower & Garden Festival – 90 Days of Fun! The 2016 Epcot Flower & Garden Festival will occur at Walt Disney World® Resort March 2-May 30, 2016 – expanding from 75 to 90 days. Here’s a look at what’s new as the festival celebrates its 23rd year! At the 2016 Epcot Flower & Garden Festival, new culinary creations at the festival’s Outdoor Kitchens will introduce fresh variety and flavor to the offerings at a record 13 festival kiosks surrounding the World Showcase Promenade. This year, La Isla Fresca takes you to the Caribbean for authentic bites, including Jamaican Braised Beef with Pigeon-Pea Rice and Jerk-Spiced Grouper or Chicken with Mango Salsa. And, at the new Cider House, a Field Greens salad with greens harvested at The Land pavilion, heirloom apples, Stilton cheese and dried blueberries will pair well with blueberry hard cider from Plant City, Florida. A new hands-on Harmony Gardens musical playground will debut featuring Disney’s Fab Five topiaries of “band leader” Mickey Mouse, as well as Minnie Mouse, Goofy, Pluto and Donald Duck. With the playground’s interactive drums, chimes and xylophones, kids can create their own musical sounds. And, as in previous years, each weekend at the Festival Center, you can dig in for a complimentary hands-on Gardening Seminar experience as they get tips from experts on a broad range of topics. Performances are at America Gardens Theatre at 5:30, 6:45, and 8 p.m. every Friday, Saturdayand Sunday of the Festival. Please note 2016 Epcot Flower & Garden Festival is included in regular Epcot admission. This entry was posted on February 4, 2016 at 11:53 am and is filed under Disney Food, Disney News, Disney Vacation Planning, Epcot, Flower & Garden Festival, Walt Disney World. You can follow any responses to this entry through the RSS 2.0 feed. You can leave a response or trackback from your own site.